Mention Hiroshima and the city name immediately conjures the image of a nuclear bomb and the city's complete destruction. Visiting Hiroshima sixty years later the only traces of the nuclear attack history are memorials scattered throughout the city. Walking around the city, riding trams, and spending the night in a hostel reveals a city that seems to have moved on and returned to the daily routine of life and cheering for the Hiroshima Carp, the local baseball team. Most travelers visit Hiroshima as a day trip, combined with Miyajima in the afternoon, from either Osaka or Kyoto. Spending additional time in the city allows you to explore the quiet neighborhoods, taste Hiroshima's version of Okonomiyaki (which is much, much better than the Osaka pancake style version), and cheer with thousands of fans, all dressed in red, at a Hiroshima Carp game. For more info on the Hiroshima Carp see Japan Baseball. At 8:15 in the morning of August 6, 1945 a nuclear bomb detonated 600 meters above Hiroshima - the resulting explosion raised temperatures in the surrounding 2-3km area to 3,000 to 4,000 degrees celcius. Approximately 80,000 people died within the first few hours - those near the hypercenter were instantly incinerated - with total deaths from burns, radiation, etc. estimated to be 140,000. These facts are presented once you begin the A-Bomb Memorial tour and create a somber effect that lasts well after you've left the museum. The musuem is extremely crowded and the audio guide rental is worth the 300 YEN so you aren’t pressed in with the crowd reading an exhibit's small print. The museum has an interesting (from a US perspective) "face-saving" component in which the Japanese do not bear any blame for the US's decision to drop the atomic bomb. The museum does not mention Japanese soldiers fight to the death mentality nor the arming of citizens in advance of a US invasion as contributing factors of the A-Bomb decision. The museum mentions that Japanese leaders did not accept a pre-bomb surrender because the terms regarding continuation of the emperor were not clearly specified - however, the emperor concept continues to this day. The reason the Japanese provide for the US's decision to drop the bomb was that the US was concerned about Russia joining the war in the Pacific Theater and creating a potential headache during post war reconstruction as was happening in Eastern Europe. To quickly end the war without Russia involvement the US dropped an atomic bomb. There is truth to this but the omission of other reasons for dropping the bomb are a conspicuous absence to an otherwise informative museum. 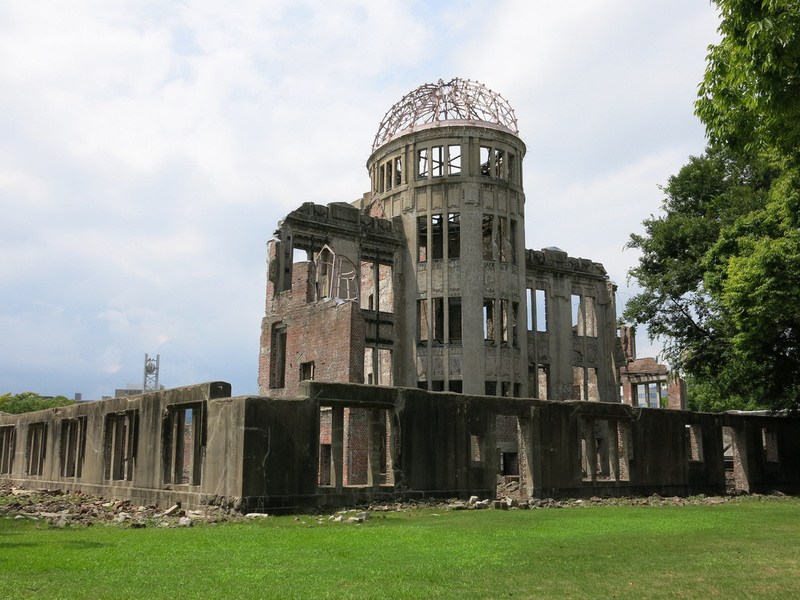 Atomic Bomb memorials are not limited to the Peace Park and the A-Bomb memorial. Just as sobering an impact is to visit two nearby schools - Honkawa and Fukuromachi Elementary Schools - which also offer a respite from the Kyoto and Osaka daytrip crowds. Honkawa was constructed with reinforced concrete and part of the original building remains next to a newer facility. The original building tells the A-Bomb story from the schools perspective and has a large diorama that shows the devastation shortly after impact. The Fukoromachi has a similar theme without the diorama. 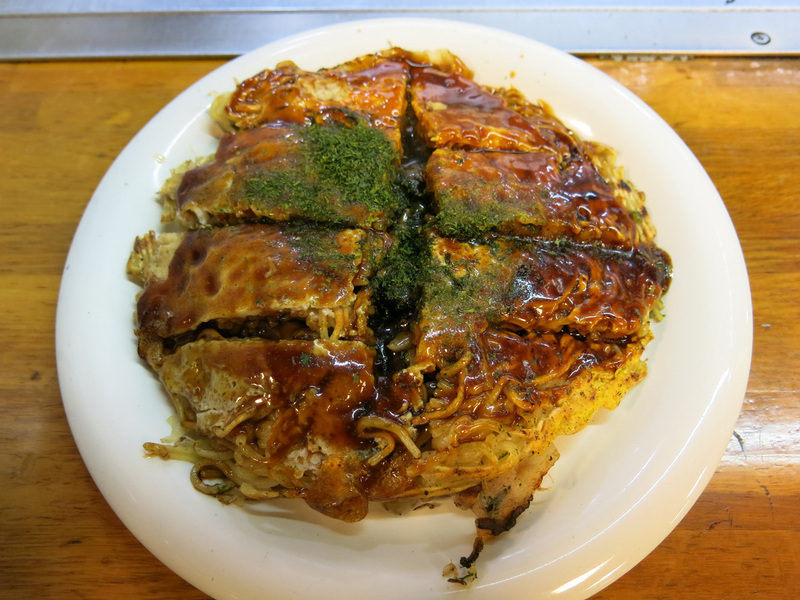 No trip to Hiroshima is complete without sampling the city's famous Okonomiyaki. There are two versions: Osaka and Hiroshima. The Hiroshima version layers the ingredients - batter on the bottom, cabbage, squid (or other fish / meat), noodles, and an egg on top. The Osaka version mixes all the ingredients in more batter with the end result looking more like a pancake then the Hiroshima dish to the right. Both are worth trying but the Osaka idea of a pancake with cabbage and noodles isn't as appealing as the Hiroshima layered version. The dish can be found at restaurants all over the city so don't do what I did and go to the most famous place in town. There was a two hour wait (fortunately the restaurant was in a part of the city with other things to see while you wait) but the ultimate crime was serving Okonomiyaki on a plate, not the griddle. You are suppose to eat the meal right off the griddle - the chef cooks in front of you and when he's finished it's a race to eat the Okonomiyaki before it starts to stick to the grill. You can see in the photo below how the restaurant was mass producing the meals. For additional Hiroshima photos see FLIKR ALBUM.